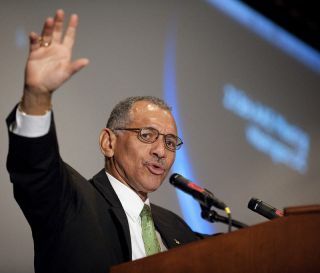 Reaching out to the Muslim world is not part of NASA chiefCharlie Bolden?s job, the White House said Monday. White House press secretary Robert Gibbs said Boldenprobably misspoke in recent remarks in which the NASA chief and formerastronaut said one of his foremost tasks in leading NASA is to engage withMuslim nations about science. "That was not his task, and that's not the task ofNASA," Gibbs said during Monday's daily briefing. NASA confirmed that Bolden misspoke. "NASA?s core mission remains one of space exploration,science and aeronautics," NASA spokesman Michael Cabbage told SPACE.com. "AdministratorBolden regrets that a statement he made during a recent interviewmischaracterized that core mission. The success of NASA?s efforts isincreasingly enhanced by mutual cooperation with dozens of other countriesaround the world that are also committed to these efforts." Bolden made the comments in an interview while visitingEgypt two weeks ago. It aired June 30 on the Arabic news network Al-Jazeera. Bolden said PresidentBarack Obama had charged him with three things upon becoming NASAadministrator. "One, he wanted me to help re-inspire children to wantto get into science and math; he wanted me to expand our internationalrelationships; and third, and perhaps foremost, he wanted me to find a way toreach out to the Muslim world and engage much more with dominantly Muslimnations to help them feel good about their historic contribution to science,math and engineering," Bolden said. The comments have ignited a flurry of controversy ?particularly over the omission of spaceexploration as one of the three goals. Michael Griffin, whom Bolden replaced as NASA? administrator,told the Washington Examiner, "It is a perversion of NASA'spurpose to conduct activities in order to make the Muslim world feel goodabout its contributions to science and mathematics." Gibbs said the president has not spoken to Bolden directlyabout his statements, though members of the administration have probablyconferred with NASA over the issue.